It's easy to get lost in the moment of cutting into a tender, juicy steak. For your table companions, however, watching you grapple with your meal may not be very appetizing. Fortunately, good steak etiquette is very simple: all it requires is a little patience and precision. There are two main schools of etiquette related to cutting meat. In the American style, also called the "zig-zag," you begin by holding your knife in your right hand and your fork in your left. Your index finger should extend down the back of the utensils; don't hold them like pencils or clench them in your fists. 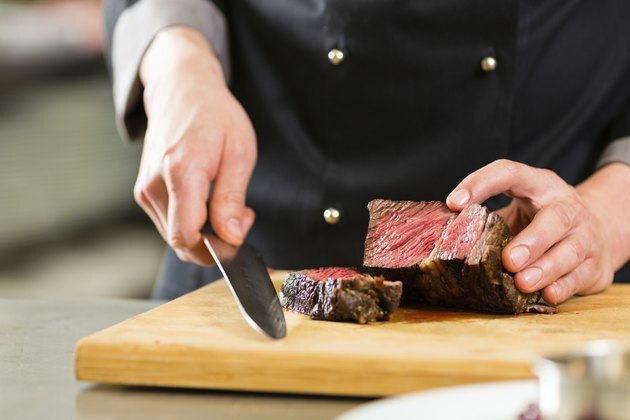 Use the fork to pin the meat and, with the knife, cut enough for a single bite. After cutting the first bite, place the knife on the plate. Do not let it touch the table or tablecloth after using it. Transfer the fork to your right hand, spear the piece of steak you just cut, and move it to your mouth. Repeat this process one bite at a time; cutting your meat into many pieces beforehand is untidy, and putting more than one bite in your mouth can be awkward, if someone speaks to you. Outside of the U.S., cutting etiquette is a little simpler. Hold the fork in the left hand and the knife in the right to begin with, just as in the American style. After cutting, use the knife to hold the cut meat in place and spear it with the fork, which remains in the left hand. Use the fork to transfer the meat to your mouth. Simpler and more efficient, this method enjoys some support, even among Americans. Whichever style of etiquette you choose, there are some basic principles to remember. Keep your elbows close to your body while eating; don't let them stick out to the sides. Never speak with your mouth full. When you're finished; place your knife and fork on your plate side by side. Most importantly, pay attention to the other diners. Most of the essence of good table manners is simply being aware of what other people at the table are doing and not doing anything that might offend or inconvenience them.